Itagaki gives offset 1903" South and 113" West from the center of M31. ASAS-SN gives offset 4543" South and 148" West from the center of M31. Spectra: Spectroscopy has not yet been reported identifying the nature of this object. Observing recommendations: Observations of all types (visual, CCD, DSLR, spectroscopy) and multiple bands as instrumentation permits are strongly encouraged as this object evolves. Dr. Koji Mukai (NASA Goddard Space Flight Center) recommends that observers use B, V, and I filters if possible to enable studying any color changes. Charts: Charts with a comparison star sequence for ASASSN-18ca may be created using the AAVSO Variable Star Plotter (VSP). Be sure to include the hyphen as shown. Submit observations: Please submit observations to the AAVSO International Database using the name ASASSN-18ca. a. Designated PNV J00423439+4044255 when posted to the IAU Central Bureau for Astronomical Telegrams Transient Object Confirmation Page (TOCP). Unless otherwise noted, the information in this Alert Notice is taken from the TOCP page or ATel #11275 (Brimacombe et al.). b. Brimacombe et al. report nothing was seen at the location of the object down to magnitude 18.6 g in images taken on 2018 February 6.12 UT and before. 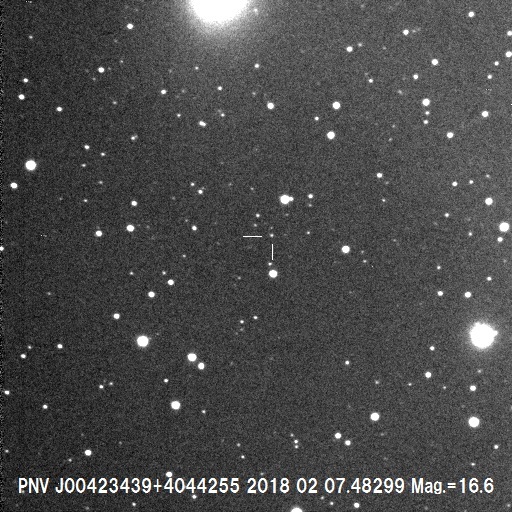 c. Confirmation of the object was also obtained on 2018 February 8 UT in images obtained by J. Brimacombe. - K. Itagaki (2018 Feb. 07.3830 UT): 34.39", 25.5"
- T. Noguchi (2018 Feb. 07.483 UT): 34.41s, 26.0"
Congratulations to Koichi Itagaki and to the ASAS-SN team on this discovery!